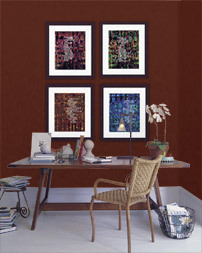 A little tender-loving care of your Hymnscript framed print will help it witness to future generations. To clean your framed print, remove it from the wall and place it flat on a table or other stable horizontal surface. Use a soft, lint-free cloth or a soft brush to clean your frame. Harsh chemicals like glass cleaner can damage Plexiglas and lacquer frames. Clean glass by spraying cleaner onto a soft cloth and then wiping the glass. This helps prevent liquids from seeping into the frame and ruining your art. Clean Plexiglas or other acrylic-type glazing with a special Plexiglas cleaner or with a mild detergent solution and soft cotton cloth. Glass cleaners that contain ammonia will cause acrylic glazing to turn yellow. Before you rehang your artwork, inspect the dust cover for damage. Replace it if it damaged. Have your framer open and inspect your fine artwork every few years. The print and materials can be gently cleaned and inspected for any hidden damage. With care, your fine art print can last for posterity, and ensuing generations will appreciate the dedication to longevity.